Two D.C. runners made detours to Mount Vernon on their way to Philadelphia and picked up first place finishes at the George Washington Parkway Classic. Carlos Jamieson (52:03) and Kerry Allen (1:02:20) tuned up for the Broad Street Run with a rehearsal 10 mile race. 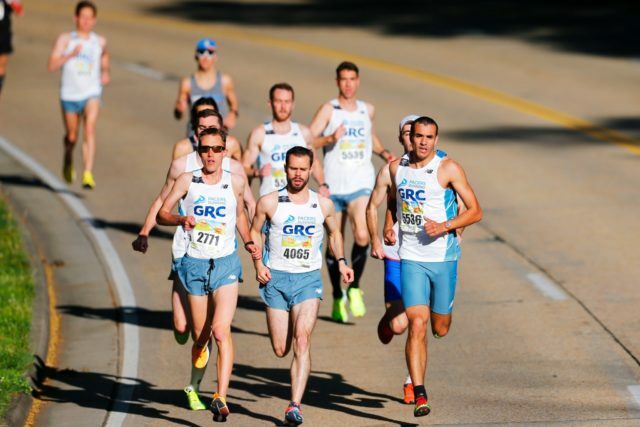 Both members of the Pacers/Georgetown Running Club/New Balance team, the pair took relaxed approaches to their races that allowed them to relish their victories but keep their focuses on next week. [button-red url=”https://results.chronotrack.com/event/results/event/event-20292″ target=”_self” position=”left”] Results [/button-red] For Allen, it was her first opportunity to break the tape while winning a race. After second place finishes at the Rock ‘n’ Roll D.C. Half Marathon and one of the Crystal City Friday 5ks, she still didn’t come into the race with much confidence, mainly because she barely slept the night before. She debated skipping the race, but was rewarded for following through with her earlier plans. Despite her fatigue, Allen dragged herself off the couch and eased into the race, only taking over from Jenny Fitzgerald (fifth, in 1:04:27) halfway through in 31:45. She practiced that patience at Friday’s Crystal City 5k, patiently waiting for a German shepherd to ease up during her light run of the course. She finished ahead of Alexandria’s Megan Truelove (1:03:42). Jamieson has had a busy few weeks of running, with a 29:34 10,000 meters the prior Saturday and a 14th place finish three weeks before at the windy Cherry Blossom Ten Mile. In winning GW, he outlasted a late challenge from fellow American University alumnus Matt Barresi (52:06), who has been living in Fluvanna County, Va. for two years after competing for the Pacers Racing Team for several years after college. Jamieson took off from Barresi and third place finisher Sam Luff (52:21) of D.C., in mile seven, but Barresi caught back up. With about a mile to go, Jamieson made a move up the short uphills and did just enough to preserve a three-second margin of victory. Already an Olympic Trails qualifier for the marathon, Jamieson hopes to hit the marks for the track trials in either the 5,000 meters or 10,000 meters, and will turn his attention back to the track after Broad Street next week. Barresi, now racing for Ragged Mountain Running, has been a frequent flyer on the parkway, missing only two of the past seven years’ races. He and his wife Joy savored the race not just as a chance to compete, but get a morning to themselves, with his parents watching their three children. Having a chance to race on the parkway motivated Alexandria’s Aidan Fischer (1:33:27) to run his first 10 mile race at age 12. His father, Bill (1:33:30), ran with him until Adian left him behind at mile eight, but Bill kept his eye on him and got to see Aidan finish. “I’m really proud of him. It was a great experience to share with my son,” Bill said. “The plan was, since it was his first long race race, was to finish the race strong and enjoy it. “We had a lot of fun training,” he said, using Hal Higdon’s training plan. Aidan’s longest had been eight miles. D.C.’s Katherine Gomer (1:13:02) used the race to balance out a long Passover Seder two nights before. “I think the Friday night gefilte fish fueled me,” she said. In the 5k, two members of the Northern Virginia Running Club, president Erin Masterson (19:14) and former Slippery Rock track athlete Phil Rector (17:36) took first place. Both live in Alexandria.